This brown kelp has no stipe as an adult, with an often well-developed holdfast. The blades vary between bright and dark brown and can grow to 150 cm in length and 80 cm wide, more commonly 30-50 cm long. There is much variation in morphology among individuals from a broad, ruffled or bullate blade to a smooth and deeply divided blade (Abbott and Hollenberg 1976). 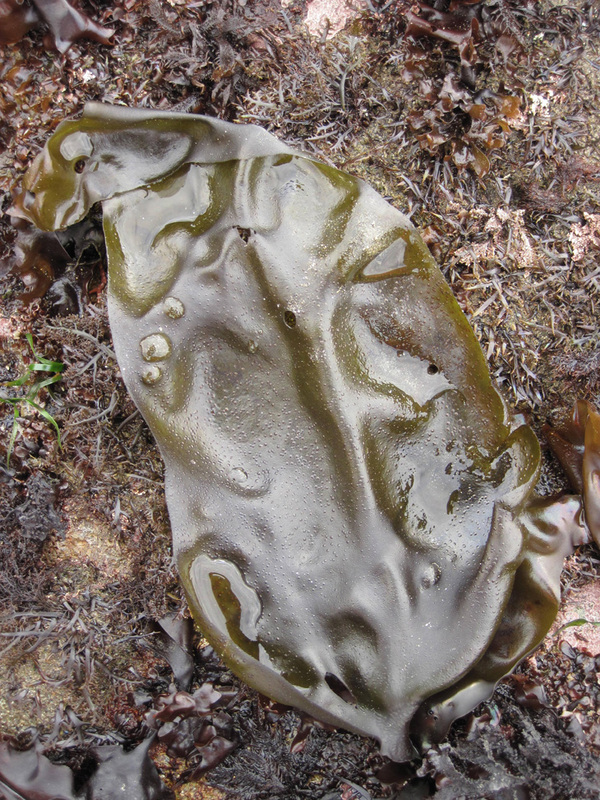 Saccharina sessile is dominant in the lower intertidal from AK to OR, especially areas of low to moderate wave exposure (Graham et al. 2000) Found on rocks in the mid to low-intertidal zones in sheltered bays to open coasts from Aleutian Islands, AK to Monterey, CA. Rare in California (Armstrong 1984, Abbott and Hollenberg 1976). Saccharina sessile blade morphology differs between exposed and sheltered areas. In protected locations the blades are broad, ruffled and generally longer (30-50 cm), which, according to Armstrong (1989), is an adaptation to life in low flow areas which increases water flow across the thallus for nutrient absorption and gas exchange. In exposed areas the blades are smooth and deeply divided, rarely more than 30 cm tall, allowing for a more compact shape at high current speeds (Armstrong 1989), although thallus size, not morphology appears to be the most important factor in reducing drag (Milligan & DeWreede 2004). Individuals at wave exposed sites have also been shown to have stiffer and stronger tissues and larger mean breaking strains than those found at more sheltered locations (Armstrong 1982). Saccharina becomes fertile in the late fall and winter with maximum sporophyte growth during the summer (O’Clair and Lindstrom 2000). As with other kelps, Saccharina has a microscopic gametophyte stage that produces gametes that fuse and form microscopic sporophytes that eventually grow into the visible macrophytes. These microscopic stages are found primarily near adult macrophytes, and may be able to persist until environmental conditions are favorable for reproduction or growth (Fox and Swanson 2007). 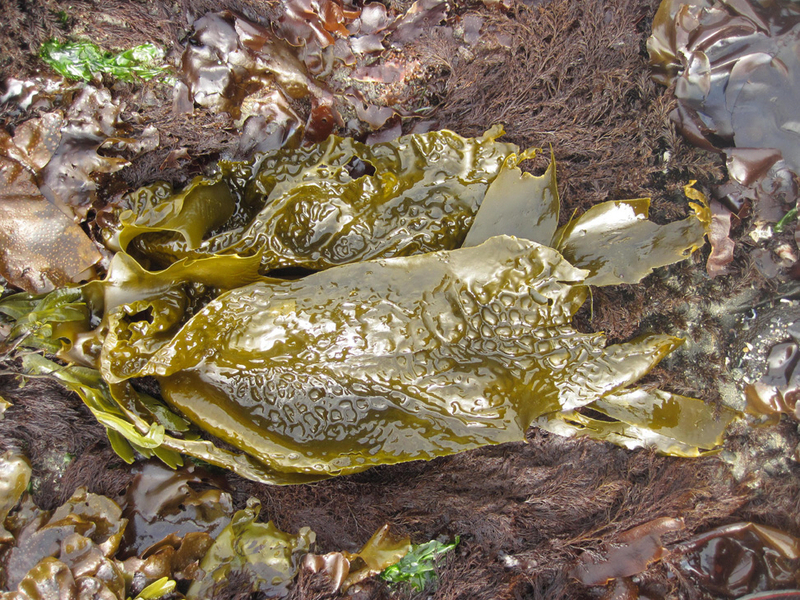 Saccharina is a poor competitor with other algae, and thrives in the presence of grazers, which generally prefer other algae, thus freeing up space for the kelp (O’Clair and Sandstrom 2000). 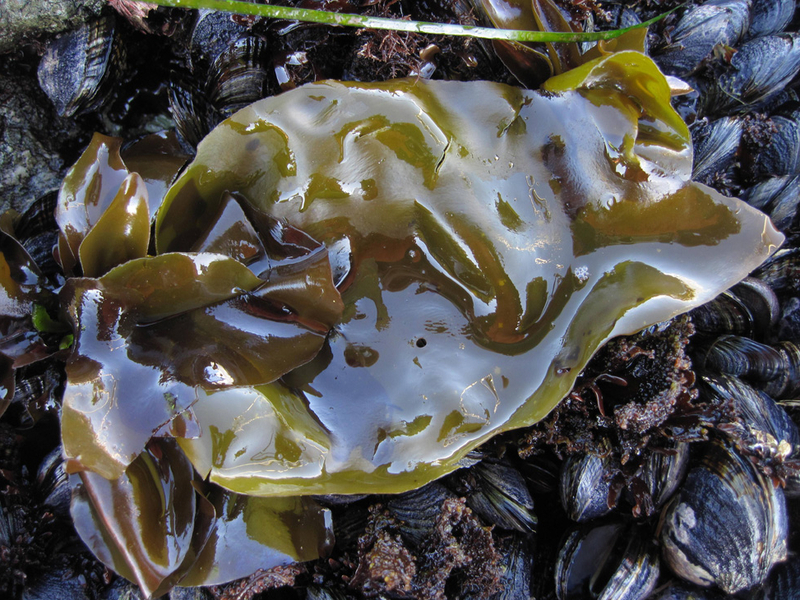 Saccharina provides canopy cover for many low intertidal species, including the chiton Katharina tunicata. Unlike most other grazers, Katharina will eat Saccharina, and chews on and burrows into the holdfasts of young plants. This action degrades holdfast integrity and makes these smaller individuals susceptible to wave-induced mortality (Markel and DeWreede 1998). 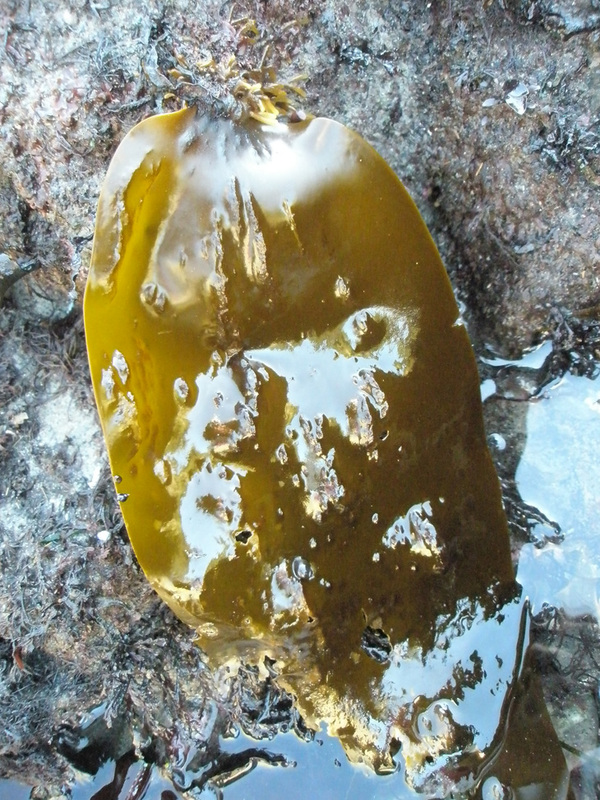 Saccharina may be sensitive to warming oceanic water temperatures; Lüning and Neushul (1978) found that female gametophyte fertility peaked at 12˚ C and dropped to 0% at 17˚ C in samples from central CA and individuals of this species from Friday Harbor, WA and Vancouver Is, British Columbia demonstrated positive net photosynthesis only in the -1.5 ˚ C – 15 ˚ C water temperature range (Lüning and Freshwater 1988). Climate change coupled with anthropogenic eutrophication may also indirectly impact Saccharina productivity through increased phytoplankton blooms. A study by Kavanaough et al. (2010) showed that S. sessile is negatively affected by shading that mimics phytoplankton-induced light limitation. The results link light limitation with strongly decreased growth rates and abundances of S. sessile and conclude that in open coast systems, where perennial macrophytes such as kelp and surf grasses are important habitat modifiers, large-scale reduction of macrophytes via phytoplankton shading could lead to profound modifications of coastal ecosystem dynamics.